QiConnect is the original wireless charging business in the UK. Through its brand manifestation, SupaPowa®, we bring expert wireless power to businesses and commercial spaces, and offer wireless power capabilities to manufacturers. We are the key technology partner to some of the highest profile businesses in the country, focusing on improving customer experiences and staff productivity, enabling them to offer invaluable benefits at the same time as potentially gaining a competitive advantage. 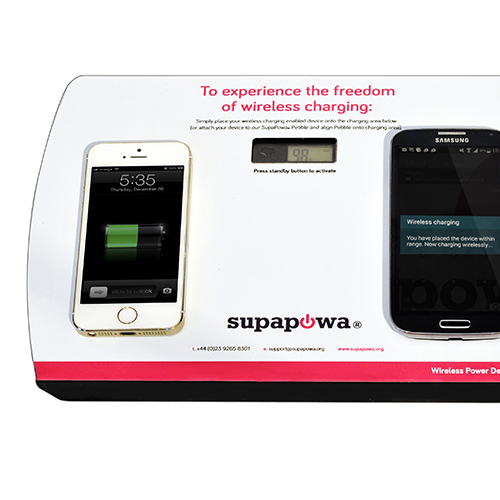 SupaPowa is considered the enabler of the UK's best wireless charging technology. Our continuous investment in product testing and development guarantees that as new technologies emerge, our products remain current and compatible. Driven by a strong desire to deliver quality and superior service, SupaPowa is the ideal technology partner for any business looking to invest in wireless charging solutions.